So this burger has been waiting to happen for a long time. It all start with the best channel in the world, Food Network obviously and they showed this restaurant called Slaters 50/50 tossing down a half bacon/half beef burger. Well thats all it took for me to love. Last week, I finally got time to visit one and lets just say it was nothing short of life changing. I ate 1.5lbs of meat and would have done more if I didn't run out. That was all of my plate and my friends whose I stole. Needless to say though, I don't like paying people to make my food when I know I can do it better and cheaper. More food for less money = WINNING. That concept right there gets you this simple recipe, I hope you enjoy. I realize not everyone if you is going to have a meat grinder like I was so fortunate to receive as a Christmas present, but do not fret this is still possible. You are just going to have to do some fine dicing of bacon into lardons which probably is way easier to clean up then my meat grinder after bacon haha. This is so yummy ! Thanks for this quick easy recipe, perfect single meal idea for myself ! This is very similar to my meatloaf recipe. I use 1 lb grass fed beef, 1 lb pork sausage, 1 egg, 1/4 cup almond flour (opt) and then top with 4-5 bacon slices! SO good! I’ve been stuffing beef and bison burgers with bacon for a now. It’s how I know everything is right in the world. Super yummy sounding! 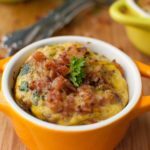 We just started going Paleo 2 weeks ago and I’m soooo glad I found your site with amazing recipes. And you look amazing, by the way! I know I just met you, but I think that I love you after this post. I work right next to Slater’s and fight eating their daily. WOW!!! Just finished the 50/50 burgers! I don’t think there’s going to be any left for the actual dinner! Not going to lie… When there’s ground beef and bacon in the fride theres a 99.99% chance that the 50/50 burgers are gonna be on the plate! Thanks again good sir! This sounds fabulous. can’t wait to try it! Okay – what is a resonable amount to pay for a lb of grass fed beef? I’ve been seeing around $7-8, is that too much? Should I look elsewhere? I made this last night–it was amazeballs. And the burgers taste even better today! Thanks for sharing! If you ever need a cheat and want to indulge, Slaters Bacon Milkshake is what I interpret as what a hug would feel like if I could drink it. Uhmayzing! Also Manhattan Meats in Manhattan beach has a fantastic bacon burger that you can pick up if one is low on time. I love your blog, keep it up. I’ll be making this tomorrow night for dinner, using coconut oil in place of the butter. Thank you, once again, for an amazing tasting recipe. You are awesomesauce.